Luke Reynolds Is Ready to BLAST-OFF! That Luke Reynolds! He's always got something new up his sleeve, hasn't he? Last year saw the release of his critically acclaimed anthology collection, BREAK THESE RULES. He's got two new middle-grade books on their way: THE LOONEY EXPERIMENT, and HOW TO SURVIVE MIDDLE SCHOOL. And now, Luke is turning his attention to the small set, in—what else?—a picture book. BEDTIME BLAST-OFF brings an imaginative twist to the time-honored bedtime ritual, where a young son and his father get into all sorts of zany play as they oh-so-slowly make their way toward bed. The book was acquired by the lovely Orli Zuravicky at Scholastic, and has already been attached to the fabulous illustrator Mike Yamada. This is sure to be a mustn't-miss project, so mark your calendars for spring 2016! IF YOU'RE READING THIS Book Birthday! Today we're welcoming into the world Trent Reedy's fourth EMLA-represented novel, IF YOU'RE READING THIS! Congratulations, Trent! This book will certainly appeal to readers who love heart-warming and "well-written sports" stories, as Voices of Youth Advocates (VOYA) calls it. Look for this one in bookstores and libraries near you! My Cover is the Best! Laurie Thompson is a busy lady. She has another cover to reveal! 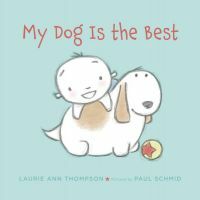 Illustrated by Paul Schmid, MY DOG IS THE BEST is a beautiful picture book about a boy and the dog he can't help but gush over. Look for it June 2015! Congratulations, Laurie! IF YOU'RE READING THIS Gets a Star! It's a starred review for Trent Reedy's IF YOU'RE READING THIS from Publisher's Weekly! They call the book "powerful and emotionally raw, with sympathetic characters and a thought-provoking premise." They say "this tale reflects Reedy's strengths: evoking the small-town American spirit, capturing the feel of the military, and getting into the heart of his teenage protagonist." What great praise! Congratulations, Trent! Look for this one on shelves August 26th. 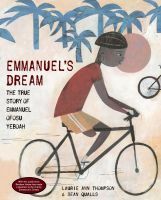 Today we're showing off the new cover of Laurie Thompson's EMMANUEL'S DREAM: THE TRUE STORY OF EMMANUEL OFOSU YEBOAH! Hasn't illustrator Sean Qualls done an amazing job? Out January 6th, 2015, this inspirational picture book is sure to warm many hearts as it tells the true story of Emmanuel, the boy who bicycled across Ghana with only one leg. Congratulations, Laurie! We love everything about it! It's a double book birthday here at EMLA! Carol Brendler's NOT VERY SCARY and Joanne Rocklin's FLEABRAIN LOVES FRANNY are both released today! Both books are already receiving high praise and now our hope is they find their way to readers everywhere. Please help Carol and Joanne welcome these lovely stories into the world. Congratulations, Carol and Melly! Congratulations, Joanne and Franny! Janet Fox certainly isn't new to publishing for kids, as she's got several books under her belt and an MFA from Vermont College, among many other accomplishments--but she IS new to publishing middle grade fiction and new to publishing fantasy (and fairly new to EMLA, to boot!). So it is with a particular thrill that I tell you that, having paid her dues for many years in many ways (including revising more than once for me), Janet saw her novel CHATELAINE find a publishing home in a relatively lickety-split process. All it takes is one passionate editor, and in this case, we had one who was so passionate that she made what we in the biz call a preemptive offer. Her vision for the book matches Janet's. And they hit it off beautifully on the phone. What's better than that? Nothing, I tell you. Kendra Levin at Viking is that editor, and today the news goes out that she will be publishing Janet's CHATELAINE: THE THIRTEENTH CHARM in winter 2016. We could not be more thrilled! CHATELAINE is a middle-grade novel set in a rundown Scottish castle during WWII. The lady of the manor has set it up as a temporary boarding school for children escaping the Blitz. But something is not right with that castle or that lady, and the children begin disappearing one by one. There are clues that hint that a spy is in the house; there are signs that can't be denied that there is a sinister magic. It's a race against the clock for one girl, her two younger siblings, and her new best friend to get to the bottom of things. I can't wait for this book to be in readers' hands! Congratulations, Janet! The School Library Journal slides in with the first review for Dana Walrath's LIKE WATER ON STONE. Best of all, it's starred! This makes us so happy as we move towards the November 2014 release date. They call the book "beautiful, yet at times [a] brutally vivid, historical verse novel" and a great choice for "astute, mature readers who enjoy books in this format or genre such as THE SURRENDER TREE by Margarita Engle (Holt, 2008) and BETWEEN SHADES OF GRAY by Ruta Sepetys (Philomel, 2011)." Congratulations, Dana! We're wishing great things for this title!